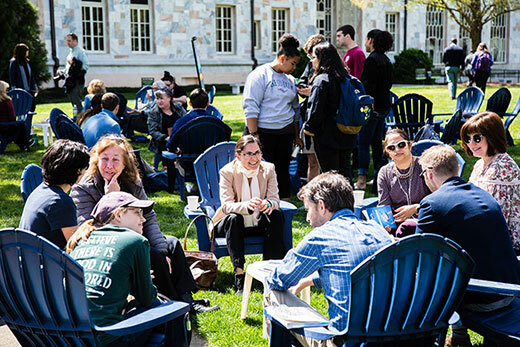 Community is the theme for the fall kickoff of “Conversations on the Quad,” set for Thursday, Oct. 4, from 11 a.m. to 3 p.m. on Emory Quadrangle. Emory President Claire E. Sterk will welcome attendees at noon followed by keynote remarks from Ed Lee, senior director of the Alben W. Barkley Forum for Debate, Deliberation and Dialogue. When did you feel like Emory was community to you? Student conversation hosts from Table Talk will help facilitate discussions. While those are the types of questions the theme will prompt during the day, participants are always welcome to come and talk about anything they want to share. “Conversations on the Quad” debuted last semester with a discussion of “Building a Culture of Innovation at Emory.” Designed as an updated take on the traditional “Classroom on the Quad” concept, these events pair free-form conversations around designated themes with ongoing social media engagement. Interact with “Conversations on the Quad” via Twitter, Instagram and Facebook.